Something happens to me during the fall where my interest in domestic affairs spikes exponentially. By domestic affairs, I mean the day-to-day maintenance of my house, not necessarily an increased vigor in national politics. Mainly, it boils down to the fact that I want to burn candles and try new recipes in the crock pot. Toss in a pumpkin dessert, and I'm set. So, while I'm on my domestic kick, I thought I'd share one more simple idea with you. Last post, I shared how to make an easy, personalized decoration for a kid's bedroom. Today I want to share my absolute favorite wall art idea, which is depicted in this frame below where I spelled our last name with pictures of letters from places that are significant to our family, like our church, the hospital where our children were born, the university we attended, and a local dairy with awesome milkshakes. 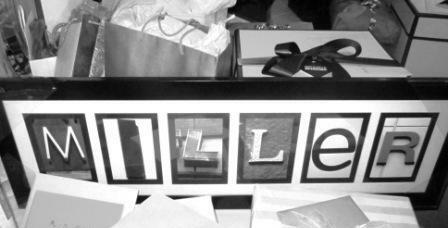 This past summer I created two of these frames as wedding gifts for our friends. Take this one below. Each letter tells a different part of the couple's early story -- where they met, where they had their first date, and where he proposed, for example. This idea could work for more than just wedding presents, of course. You could easily spell your child's name by taking letters from his or her favorite places -- the library, school, streets, restaurants, or parks. Or, you and your children could search for letters in everyday settings or from nature to photograph. An upside down trellis could form an A. A sideways view of a traffic light would make a convincing E.
I'll make it up to her with one of those awesome milkshakes. Love this idea!! It has inspired me! Love your picture frame ideas. I'm so un-crafty, I have to go to other blogs to get any ideas. And I'm the exact same way in the Fall: candles, crock pots, slippers and baking up a storm. What is it about Fall? Must be some kind of animal-instinct to hibernate or something? Robin, that is the coolest idea!